"Here To Help Create A Beautiful, Healing and Dignified Experience"
Sea services as unique as the life lived. Our services are held in San Diego, Oceanside, Dana Point, Newport Beach, Los Angeles, San Pedro, Redondo Beach, Marina Del Rey, Oxnard, Ventura, Morro Bay, Monterey, San Francisco, Oregon and more locations. West Coast - East Coast, we have you covered, including full body burial at sea. 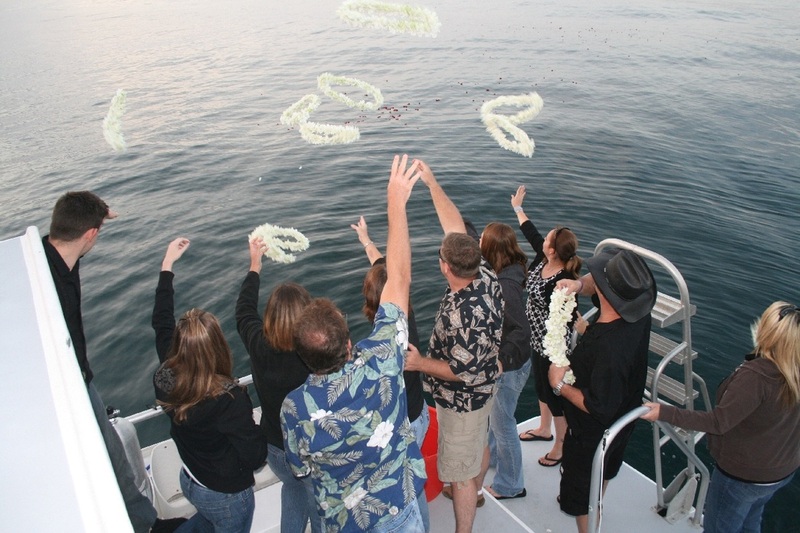 ​Your Memorial Service could be a simple onboard service where the ashes are scattered, or a more involved event such as an eternal reef placement or full body burial at sea. The important thing is to honor and remember your loved one in a meaningful and significant way. Request information or schedule a date. "How far out do you go?" ​"Can we participate in the service?" ﻿Here's where you will have access to PDF forms, downloadable printouts, and other resources such as TWA regulations on carrying cremains on an airplane.